Klaus Schultze: Audentity (1983). Innovative communication KS 800025-26 (2xLP – photo: signed copy, bought at Ringstrom in Oslo, August 2014). The title may be a little pretentious, but this is a very good double album.”Audentity” – well, in a sense, yes, it is about audio identity. The songs are symphonic works, up to 31 minutes per LP side. The musicians are really allowed to stretch out. 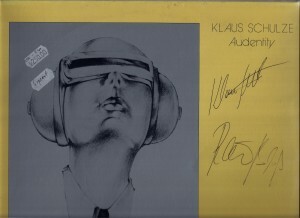 Instead of poor orchestration (typical of progrock etc), we just get Schultze (“computer and keys, program”) and Rainer Bloss (“sounds, Glockenspiel”) doing several synth voices, replicating an orchestra, and if this is a little limited, it is also often rewarding and fresh. Moreover instead of a drum machine we get Michael Shrieve, excellent on drums as always. Besides Schultze, the album’s biggest surprise is Wolfgang Tiepold on cello, who offers much of the orchestrated feel, playing stellar complex cello along the way. I really like this – not least, since I got hold of a signed copy. Great sound. Big ambitions. The pomposity scale is quite low, the exploration scale quite high, making for an enjoyable album.